Every year, shocks, disasters and hazards such as earthquakes, floods, pandemics and landslides, lead to thousands of avoidable deaths. Information shared at the right time, in an understandable format, by trusted sources, can be the most effective life-saving tool in such events. Indeed, knowledge is empowerment when it comes to preparing for, mitigating the impact and responding to shocks and hazards. Deciding on a family preparedness plan; pre-identifying evacuation routes in the building and neighbourhood; knowing to turn the electricity-box off in the event of flooding; remembering to check on older persons in a heat wave: these are the sorts of measures that can equip individuals and families to confidently take action and stay safe in the face of disasters. In a changing climate, with increased risks of extreme weather and disasters, the public will need to have a greater awareness of the risks they face and what they can do to be prepared. The International Federation of Red Cross and Red Crescent Societies (IFRC) and Save the Children have a long history of helping communities build their resilience. Building on the success of the first edition of Public awareness and public education for disaster risk reduction: key messages published in 2013, this second edition Public Awareness and Public Education for Disaster Risk Reduction: Actionoriented key messages for households and schools continues this tradition, providing an updated tool that will support communities to build their knowledge-base and put in place their own measures to stay safe. 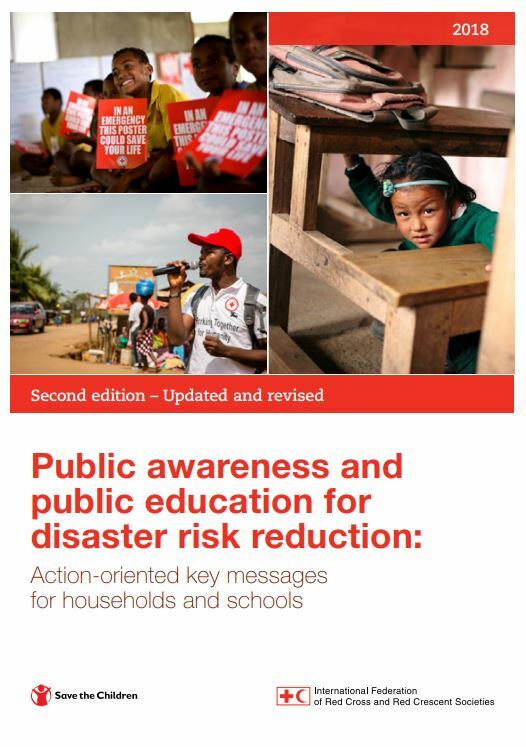 This updated publication provides practical advice and guidance on the nature of messages and information to share with the public, for use by all institutions with a responsibility for improving the safety of communities at risk and to mitigate the impact of shocks, hazards and disasters. Governments, nongovernmental organizations, the United Nations and others can all use this guidance for national adaptation and to help prepare households. Active, consistent and clear messaging is vital to create a culture of safety and common understanding. It contains revised messages that cover additional hazards, and more details on key issues to be considered for effective disaster preparedness, such as climate change, gender and inclusion. There is also greater guidance on child protection, school safety and community engagement. We see it as a significant contribution to our collective work to reduce disaster risks, and ultimately save lives.